British broadcaster BSkyB has announced that it’s launching an all-new TV service called Sky Q. Announced today at an event in London, the company says that the service will bring together the best content from around the world and make it easy to access from any device. The launch is the biggest for the company since the introduction of the Sky Now service, which provides on-demand viewing from a selection of channels for a flat monthly fee. Sky Q will be available in the UK and Ireland from the beginning of 2016, the company said. The Sky Q box is almost half the size of the current Sky HD box, and has a 2TB drive for storing up to five times more recordings than the current generation. It’ll also be able to record up to four channels at once. The remote has also been overhauled, offering up a touchscreen panel and Bluetooth connectivity. There’s also a Sky Q Mini box, which is the first physical product from the company to offer its main service without needing to be connected to a satellite dish. 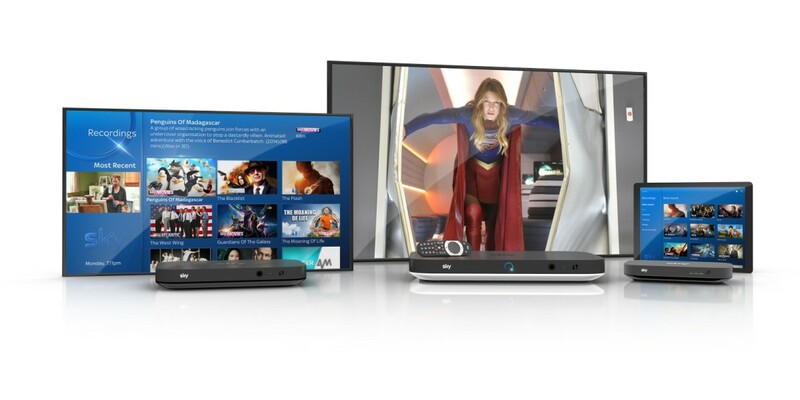 Rounding off the new introductions is a Sky Q Wi-Fi Hub and Sky Q app to manage your viewing across the different Sky Q devices – there’s even a network boosting feature that meshes your Q devices together to boost your broadband’s reach. Of course, to usher in the new generation of devices and services, there’s a redesigned UI too, with more emphasis on your recordings and favorites. There’s also a new semi-transparent sidebar to provide access to apps in just a few presses. It’ll arrive with YouTube and Vimeo ready to go out of the box. There’s also a new My Q section, which includes things like shows you’ve paused part-way through – clicking the show takes you to where you left off rather than having t0 find where you last viewed. All of the existing catch-up services already on Sky’s current service will also work on the Sky Q box. It also helps you to discover new content, and changes what’s displayed based on things like time of day, as well as your own preferences. One of the most-requested features from Sky customers has long been the ability to watch recorded shows via a mobile or tablet. With a new feature called Q Snyc, you’ll finally be able to do this. As the box now uses a Bluetooth connection for the remote, the device also supports streaming music directly from your phone or computer to your TV via the Sky Q box. You’ll also be able to stream music over Wi-Fi via Airplay. The company says the box supports UHD content and that its services would be launching in the second half of 2016. An update to the system will also introduce voice search, making use of the microphone buried away in the remote control. The one big question that remains is pricing, which isn’t one the company is answering today.